Light-filled 1 bedroom plus den/office residence in the desirable Strickland Row Condominium. Spectacular character and volume. 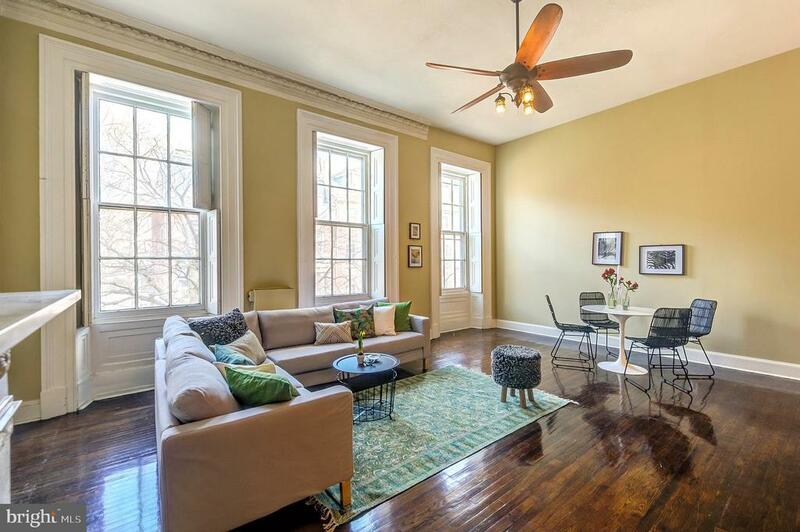 12.5 ceilings and just refinished original hardwood throughout. Huge open living and dining--over 22 wide with three amazing 6 over 6 pane double hung windows across the entire front. Wood burning fireplace with original marble mantle. Ceiling fan. Beautiful original moldings and details. Extra room off the living room that is perfect for den or office. Granite and stainless steel kitchen. Really big bedroom with closet and included wardrobe (and storage above the closet). Ceiling fan. Two huge south facing windows. Wood burning fireplace with marble mantle. High efficiency Bosch Washer and dryer in unit. Note--the bedroom has a new HVAC unit. Management is currently installing these new units throughout Strickland Row, and 2F will receive a new one for the Living room as well. No cost to owner. HVAC units are paid for and maintained by the building. Strickland Row is a professionally managed building. It offers bike storage, and a huge shared roof deck with great city views. Within blocks of Whole Foods, ACME, Center Citys best restaurants, shopping and coffee shops. Not to mention all the hospitals and universities are an easy walk, bike, or SEPTA. Notes: Multi-zone HVAC maintained by condo. Excellent building management with designated property manager. Condo fee is $568/month PLUS $213/month Utility Fee (PLUS average of $45/month electric plug-ins). This covers ALL UTILITIES, and of course insurance, roof, unit HVAC maintenance, all building maintenance, pool and landscaping, professional management, capital reserves, etc. SELLER WILL CREDIT BUYER HALF OF CONDO FEE AND UTILITY FEE FOR ONE YEAR.